An overview of the different styles of planted aquariums. Different types of plants you could use. Popular plants. 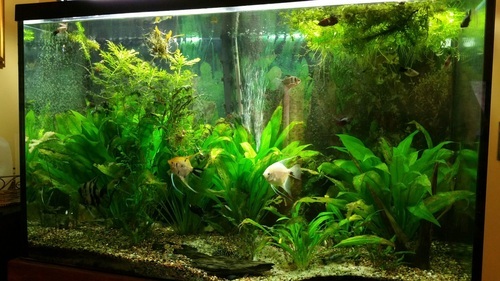 Many hobbyists with fish tanks are naturally drawn to having plants within their tanks. Keeping plants in your tank just seems to make common sense. But real plants or fake? As you'll read on, you'll discover that it's not as straight forward as it may first seem. 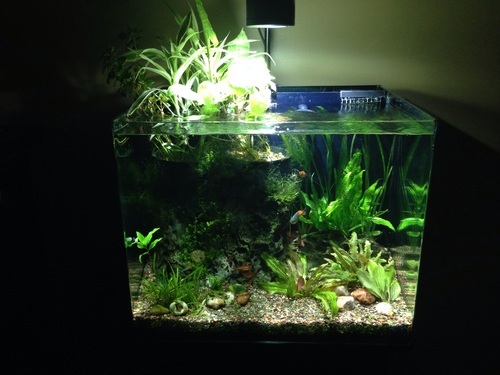 This article will first give you an overview of the different styles of planted aquariums, go over different types of plants you could use, including plastic plants, and then go over in detail the pros and cons of keeping live plants in your aquarium. We'll conclude this article with a list of popular plants for either freshwater or saltwater tanks. Note that most of this article focuses on freshwater plants. That's because there aren't really the same type of plants for saltwater tanks. Most "plants" in saltwater tanks are limited to macro-algae. They don't provide the same look or purpose that freshwater plants do. Instead, you'll find more invertebrates in the saltwater tank taking the place of plants, such as corals and anemones. Many reef tank owners will grow algae in a refugium beneath the tank (located with the sump) which is used to feed invertebrates. Natural style is pretty wide open. Even though the appearance may appear unplanned, often times, nothing can be further from the truth! 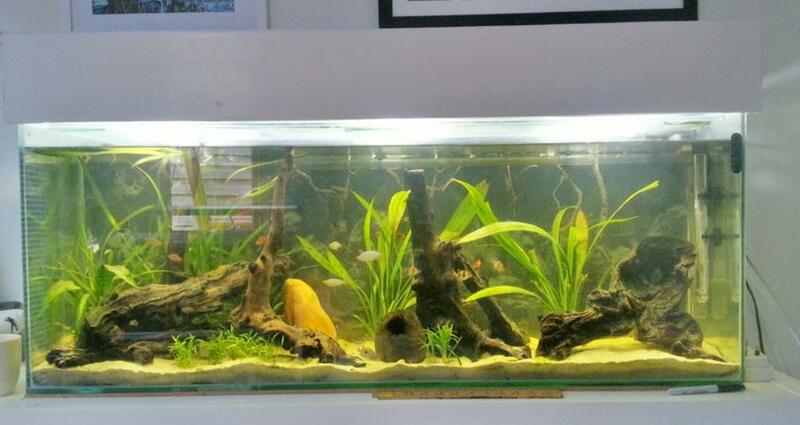 A Natural style aquarium strives to replicate what you'd find in nature within your tank. Plants will be placed so that they appear random and without design (this doesn't mean that you're actually dropping plants into your tank without design, but it just won't look manicured when you're finished). Think "zoo exhibit." You'd never come across a patch of water with a "Dutch style plant painting" in real life. Dutch style aquariums are the Home & Garden of all aquariums. Think, a "horticulturist's back yard." Many tanks might not even include fish or if they do, they'll appear to be an afterthought. The fish included will certainly never be bright or interesting enough as to overshadow any of the plantings! 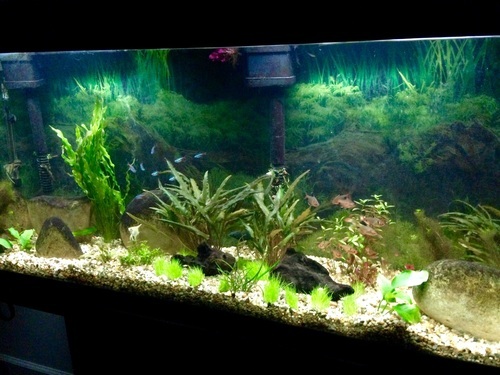 Dutch style aquariums are usually terraced so that the entire tank is full of plants, all of which are viewable from the front with the front of the tank is lower than the back. The tank may have 2-3 three "steps" of terraced substrate supporting different types of plants. Dutch style aquariums are fantasies that have come to life. Open Planting style tanks are those in which the top of the aquarium is left open and plants are allowed to grow out of the water. A Mangrove is a perfect example of a plant used in an Open style planting. If you go this route, make sure you don't have any jumpers! A community tank or a habitat tank is a tank where you've placed species of fish and plants that are well suited for each other. Ideally, they'd be from the same place geographically and would mimic an ecosystem found out in the wild. Sometimes, hobbyists will use the term "Habitat tank" to mean a tank that they've limited to just one kind of fish. The planting in this style tank aren't as exciting (to the viewer at least), at least not compared to other aquarium planting styles. That's because in a community or habitat tank, what you do is place plants that would naturally occur in the wild, as they do in the wild. To the hobbyist, a community tank can be an extremely complicated, challenging, and rewarding venture. Now that's we've talked about the different styles of fish tanks that you'd find associated with live plants, we're going to discuss the different types of plants that you can get for your tank. Plants used in fish aquariums are usually categorized by their "behavior." That is - will they stay rooted; are they bunches that move around in the water; or do they like to float on the top of the tank. Be careful that you don't put common household plants into your tanks - they aren't aquatic plants and long term results won't be good. Real plants help reduce carbon dioxide levels in the tank water. Real plants help reduce the nitrate level in the tank water. Real plants give additional oxygen to the tank water. Real plants can provide a natural source of food for fish (if the fish aren't too aggressive with their nibbling!). Real plants can inhibit algae growth by releasing chemicals in the water that inhibit algae growth. Real plants can serve as a "miner's canary" for your tank water. While plants have different needs from your fish from the water, plants will be the first thing to start dying off if something in the tank isn't right. Keeping real plants in your aquarium requires you to actually keep something alive in your tank besides your fish. Keeping real plants in your tank means that there is one more thing you have to nurture. They have specific needs that differ from your fish needs. You'll need to educate yourself on how to best grow plants in your tank. Keeping real plants in your tank requires maintenance time. Plants will require you to trim dead or decaying parts as well as cull parts that are too numerous or prune the plant back to keep it the appropriate size for your tank. Real plants will require replacement as they don't last forever (or at least not as long as manufactured plants). Plants require more lighting than your fish do. Real plants require CO2 reactors if you want to keep your plants at their best. If you have an expensive plant set up, you may want to consider this. Plants create waste when they die which negatively affect the water quality. Plants can often introduce pesky snails, unwanted fish, or even hydras who hitch a ride along from the pet store. Real plants can introduce disease to either your other plants or your fish in your tank! Real plants may not be able to keep up with herbivorous fishes' appetites! Nibbled plants don't usually look that great. Keeping real plants in your tank may require you to limit yourself with suitable substrates. You can also try to keep the plant potted in its own substrate, buried within the more general substrate (gravel) that you keep in your tank. Overall, it can be a tough decision for the fish aquarium hobbyist to decide whether to incorporate real plants or manufactured plants into their tanks. Java Moss – This type of plant is very low-maintenance and it grows particularly well on rocks and driftwood – this makes it ideal for planted tanks in the Natural style. Java moss tolerates all kind of lighting and it prefers a tank temperature between 70°F and 75°F. Water Wisteria – This type of plant grows very quickly and it requires very little maintenance. Water wisteria produces tall, lace-like leaves and it grows best in medium lighting and temperatures between 74°F and 82°F. Java Fern – These plants are incredibly versatile – they grow in low to medium light and they can be used just about anywhere in the aquarium. Java ferns produce bundles of long leaves which makes them great for background decoration. Crypts – These plants are very easy to care for and they produce medium-sized pointed leaves. This type of plant does well in all levels of lighting and it is tolerant of temperatures ranging between 68°F and 86°F. Lilaeopsis – This type of plant resembles grass and it only grows about 2 inches tall – this makes it great as a foreground plant. Lilaeopsis plants require medium lighting and they do well in temperatures between 74°F and 85°F. Amazon Sword – This type of plant can grow very large – it produces long, sword-like leaves that grow up to 20 inches long. Amazon sword plants make great background plants and they can tolerate moderate lighting and a temperature range of 72°F to 82°F. Water Sprite – Also known as Indian Fern, the Water Sprite plant is a perfect mid-ground plant but it can also be used as a floating plant. This plant does well in moderate lighting and it typically grows up to 12 inches long. Hygrophila Polysperma – This type of plant is typically used as a background plant because it can grow up to two feet tall. Hygrophila prefers moderate lighting and it does best in a tank temperature range of 72°F to 82°F. Anubias – This type of plant is best for the foreground of the tank because it only grows about 6 inches high. Anubias plants produce dark, oval-shaped leaves and it prefers moderate lighting with a tank temperature between 72°F and 82°F. Duckweed – This type of plant floats on the surface of the tank water and does not need to be rooted in substrate. Duckweed grows very quickly and it helps to reduce the intensity of tank lighting – it also serves as a food source for fish. For saltwater aquariums, the following species are commonly used. Saltwater aquariums, however, use plants fairly sparsely and favor the use of corals and invertebrates as alternative (and very interesting) forms of non-fish livestock. Historically, algae used to be classified as plants. Now, biologists separate algae from plants taxonomically. Halimeda, also known as the Cactus algae, is one of the oldest cultured algae you'll find in a saltwater tank (its inclusion goes back to the 1960s). Plants in your tank give the aquarium a more natural habitat. Plants in your tank give fish spawning ground. Plants in your tank also provide natural habitat for baby fish (fry). Of course, you'll want to move fry into their own tank if you want them to make it. We hope that with the information provided in this article, you can decide for yourself whether to add real plants to your tank or not. Even if you decide to stick with manufactured plants, your options are so great today that your tank's aesthetic appeal won't suffer with the addition of "fake" plants. Good planting!